Heat oven to 350°F. Grease and flour 13x9-inch pan. In large bowl, combine all cake ingredients; beat at low speed until moistened. Beat 2 minutes at high speed. Pour batter into greased and floured pan. Bake at 350°F. for 35 to 40 minutes or until toothpick inserted in center comes out clean. Cool 1 hour or until completely cooled. For frosting, in large bowl, beat butter until light and fluffy. Gradually add powdered sugar, beating well after each addition. Beat in orange marmalade. Add milk 1 tablespoon at a time, beating until of desired spreading consistency. Frost cooled cake. In small saucepan, melt chocolate chips with oil, stirring constantly until smooth. Drizzle over frosting. 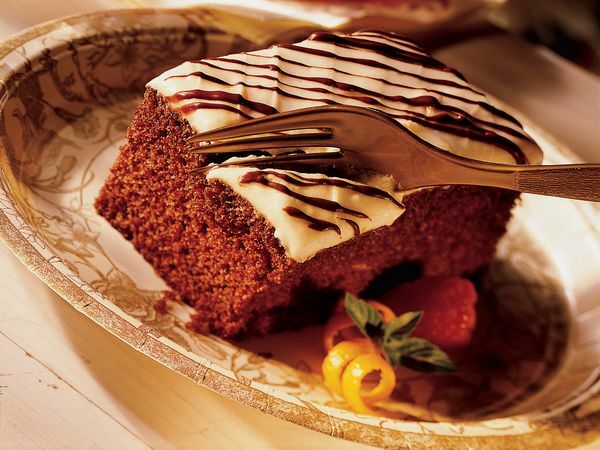 Orange marmalade gives this cake its orange kick. This fruit preserve has a softer set than jam, and contains bits of fruit peel, particularly citrus rind. With a plastic bag and the microwave, it’s easy to melt chocolate and decorate a cake. Place the chocolate chips and oil in a small plastic bag. Microwave on HIGH about 1 minute, until the chips are just melted. Knead the bag gently to combine the chips and oil. Snip a very small opening off one corner of the bag and squeeze to drizzle the glaze over the cake.